Joseph and Annie wasted no time in starting a family; Anna was born in 1875 (a little too soon after the wedding, actually), Amelia also in 1875 (she must have been born very prematurely and did not live), Mary Theresa in 1876, followed by Augustus in 1878 and Adelaide in 1880. These children were followed by Joseph B. in 1883, Bernhard in 1885 (he did not survive childhood), Catherine in 1886, Herman in 1888, Henry in 1891, and William in 1893. Annie started at the age of 19 and gave birth to 11 children in 18 years. Back in 2013, I wrote a post about Joseph Ortmann in which I mentioned the various occupations I had gleaned from census data and directories -- he was a variety/candy store owner, a butcher, and a cabinet maker. They also moved very frequently (it seems to me) -- I have them living in at least six different places in less than 20 years. What would it be like to have to move with 6 or 8 kids running around in the house? I know that Annie had four or five brothers, so maybe they helped. And they were always renters, never homeowners. And how big could their apartments have been? These were obviously not wealthy people, and at times they had people living with them besides their nuclear family: in the 1880 census, there's an Irish woman, a dressmaker, living with them; in the 1900 census, Annie's brother Herman is living with them; in 1910, Adelaide has returned home with her son, Louis. In the 1900 census, there are 12 people living in the apartment -- even if the apartment had four bedrooms, which I doubt, that's still a pretty tight squeeze. Joseph died in 1911; Annie lived on until 1936. There's a very interesting story in Joseph's pension file that I'll tell later, when I get it sorted out. But what I'm most interested in is what became of all those children. I'll tell you what I know about each one. Anna: Never married; lived with her mother until Annie died in 1936; from then on, she lived with her brother Henry. She worked as an "operator," which I think means she ran a machine, mostly in an underwear factory. She died in 1943. Mary Theresa: Worked in the millinery business; married at the age of 28 to Joseph Schumm; had six children. She died in 1935. 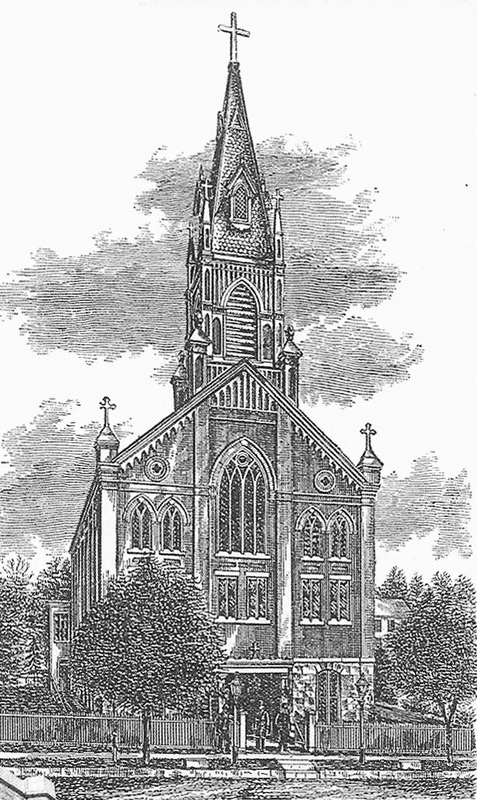 Augustus: At the age of 26, he was married to Adeline; by the age of 31, he was living in Wilmington, Delaware, with Adeline and a daughter, Anna, four years old. He was an electrician. In 1917, he was living in Reading, PA, working as a superintendent for a substation of Metropolitan Edison. He died in 1941. Adelaide: In 1906 she married Louis Schulz, who seems to have died in the next couple of years; by 1910 she's back at home with a son, Louis. After that, I lose track of her. Joseph: I've written the first part of Joseph's story here. He was the adventurous Ortmann -- he went to Missouri, Texas, Mexico, and California, working mostly in the restaurant/hotel business. He married two sisters, Clara and Mabel Manson. It's a story with a sad end that I'm hoping to be able to tell soon. He died in 1967. Bernhard: Died at some point in childhood, though I haven't yet found a death notice. Catherine: Married Charles Hoertel and had two sons. They lived in New Jersey. Herman: I've written the story of Herman here. He had a successful career as a printer and was prominent in the social and civic scene in his community. He had no biological children; when he married Mary Gross, he acquired a stepson, Herbert. Herman died in 1960. Herman Ortmann is second from the right in the top row. Henry: Henry's first job was driving an "ad wagon" -- I assume some kind of advertising that was driven around the streets. By 1917, he's married to Mabel and they have two daughters; he's working as an auto mechanic. By 1920 he's working as a "chauffeur" in a lumber yard. I'm not sure what that is -- and in 1940 it looks as if he's a "patrol man." I can't find a death date for Henry. William J.: My grandfather. Born in 1893, by 1910 he was working as a clerk in an automobile business. He married Mary Siegler on 29 June 1921, and they had one child, William John Jr., who was born on April 6, 1925. By 1930 he was working as an auto mechanic, and by 1940 as a distiller in a distillery company. I loved my grandpa -- he would save up the funny papers from the Sunday newspaper and then send them to us, usually with some cookies from the corner store. The papers smelled of his cigars. He died in 1955. A typical American family, I guess. No black sheep or loose women, just a family of hardworking siblings. While they could all read and write, it seems that none went very far in school. It interests me that, having grown up in such a crowded, poor, and probably chaotic household, most of them had only a few children. And of those children, only two of them were sons born with the Ortmann name: Joseph Bernard Ortmann, Jr., who died without either marrying or having children, as far as I can tell; and William John Ortman, Jr., my dad, who had one son. So of all the possible branches of the family, only one, ours, carries on the Ortman name, and how ironic that it's the one branch that was lopped off the family tree. How strange, but it's another explanation for why I have trouble finding cousins -- they would be named Schumm, Hoertel, or Schulz. So far, I've only found one Schumm cousin. So, doing this has been helpful, to do a bio of a whole family instead of just one person. I'm still working on a couple of the individual stories, but it's hard. 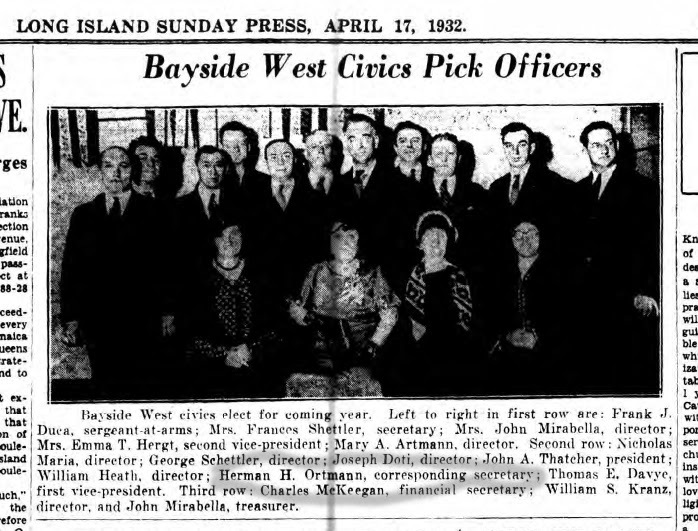 This is not a family that left a lot of traces; only Herman, with his civic involvement, and my father, with his theater work, made it into the papers regularly. I know of no letters or diaries, though I would be thrilled if they existed somewhere. I'd particularly love to know more about my great-grandmother, Annie Schwietering; for some reason I feel drawn to her. But I imagine with all those children running around, she had little time for reflection and diary writing. I will forge on, accumulating information that will allow me to write the stories of ancestors' lives. And I'll keep seeking those elusive cousins, in the hope that they will have more photographs and information for me.